Enjoy the charm and colonial ambiance of Alexandria with a 40-minute narrated Seaport Cruise. Or board our cruise operating between two magnificent historic sites — Alexandria (in Virginia) and Georgetown (on the Washington, D.C. side of the river). 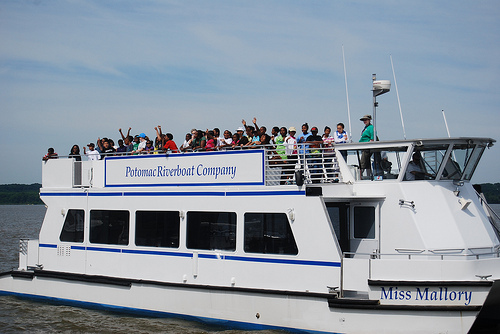 En-route see America’s greatest monuments from the river while enjoying a narrated tour. Or board a narrated cruise for a trip south to George Washington’s Mount Vernon Estate & Gardens, the number one historic home in America. The vessel stops at National Harbor and Gaylord National Hotel along the way. Learn about the history of this scenic area and the great Potomac River that begins 200 miles away in the mountains of Maryland and West Virginia, emptying into the Chesapeake Bay 90 miles south of Alexandria. Wildlife, natural beauty, spectacular sunsets, Washington D.C.’s monuments, and a rich American history await. Don’t miss our baseball boat (www.baseballboat.com) for 2012, a great way to travel to the new National’s Stadium on the Anacostia River.